The following steps are Learnball League Staff Development procedures that enable a small pilot group of teachers to quickly transform the student peer norm in an entire school by implementing Learnball and sponsoring school-wide Learnball Tournament activities. 1. Form a Learnball pilot group and select a coordinator who obtains (1) The Learnball Classroom Guide and ball for classroom use and (2) Learnball: Origins and Rationale, the teacher’s reference guide. 2. After reading both manuals, the coordinator calls or sends email to Learnball League and forwards any questions raised in the pilot group meetings. Then the coordinator ensures that the application forms of the other pilot group members are properly submitted. 3. Each pilot group member receives a copy of The Learnball Classroom Guide and a four-inch foam ball with an official Learnball logo on it for classroom use. In addition, the coordinator circulates an Origins among pilot group members so that all read the teacher's reference guide. 4. After reading both Learnball: Origins and Rationale and The Learnball Classroom Guide, pilot group members carefully review key staff development steps listed on pages 37-42 of The Guide before implementing the process. 5. 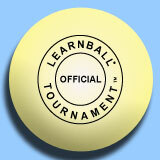 As soon as student classroom teams are organized, teachers register the teams with the League and obtain an official registration certificate, a large eight-inch foam ball with an official Learnball Tournament® logo on it, and instructions for Learnball Tournament activities. 6. The coordinator contacts the League to obtain assistance in creating a Tournament plan and other helpful items tailored to the specific situation. 7. The coordinator explains Learnball Tournament activities to the faculty and gathers faculty and community support for the Tournament. No, none at all. The Learnball Classroom Guide contains easy-to-follow, behaviorally-stated steps that contain carefully written speeches for students to use in forming teams and operating the contest. Also, the teacher's reference guide, Learnball: Origins and Rationale, explains for the teacher how all of the underlying psychological and sociological principles are used. Thousands of League members have used these books for over 35 years without any inservice training whatsoever. Now, since the materials have been revised many times and are even easier to use, success is guaranteed. Absolutely NOT! Learnball must be introduced in regular or advantaged classes before being implemented in difficult situations because peer-group dynamics are such that peer leaders set the standard for the group. Disadvantaged students will follow in the footsteps of the advantaged, but the opposite is rarely true. Consequently, where possible, begin Learnball at the highest grade level. Also, move quickly to form Learnball Tournament teams to create broad-based support. Remember, a rising tide raises all boats. The main Learnball concept is that one student or a small group of students will only improve behavior when there is a perception that the larger student body endorses and supports improvements. Any principal and faculty desirous of helping a disruptive minority—or special-needs students—to improve, therefore, will have much more success when a significant percentage of the school population are Learnball Tournament team members and lead the way. Why is it important to follow ALL Learnball Classroom Guide steps? The Learnball process is a gestalt that combines many concepts, and the sum is greater than the total of the parts. To achieve proper results, therefore, the careful following of all steps in order must be executed. Following The Guide steps in a precise manner ensures success, but deviating invites trouble! In addition, The Guide represents the work of many experienced members over 35 years. New members, therefore, have an obligation to honor the hard work of the past contributors, and in faithfully following the steps, uphold the integrity of the process. Doing so insures that Learnball's success record continues and that all members everywhere can continue to reap the benefits of Learnball. Why must Staff Development Steps be followed exactly? There invariably is some social ripple in a school whenever any significant improvement, such as Learnball, is introduced. How the new idea is introduced is key to whether or not the transition is smooth or rocky. It is crucial, therefore, that everyone who wishes to implement Learnball has the opportunity to do so, not a select few. By the same token, faculty members who do not want to use Learnball must not be pressured to use it. Whenever the Learnball pilot group carefully follows League advice, school-wide attendance, motivation, discipline, and self-esteem increase and faculty support is solid.